Seaquest State Park, Washington State. The hike was gorgeous. Timing. The timing was all off for me this year. It was our first vacation in eight years due to the economy. I'd have done better with a vacation later in the fall or smack dab in winter, in between books. 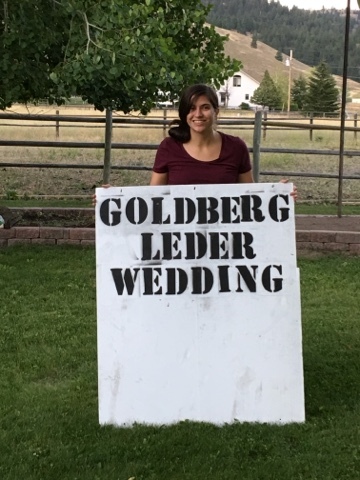 Definitely after my commitment with judging books (I get paid to do that each summer) and after my daughter's wedding. Two things that took up most of my summer, time, and energy. Oh, did I mention I also started my college classes three weeks before that vacation time to get my genealogy degree? Type. The RV vacation sounded great on the surface. 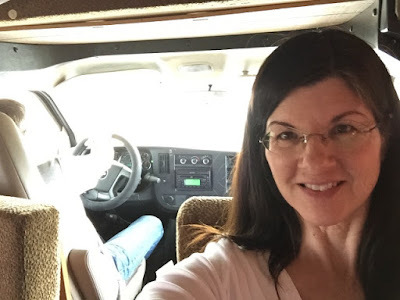 But changing camping spaces every single day (Hubby wanted to do that) was exhausting and frustrating to me. We lost hours each day unhooking and moving. I really wanted to just stay in one place at least half the week rather than pull up camp and resettle each day. Not my kind of relaxation. But I did the best I could under the circumstances to work while moving. I often write while traveling in planes or if Hubby is driving. He's a quiet sort. That means lengthy talks on long rides don't really light up his day. Kind of perfect for a writer who has to get work done. We tend to spend more time talking or together in the late evening. Yes, I really do work on the road while he drives, as long as I don't get motion sick from shadow flickers. Ugh. Travel. Taking work along was a given because I had to fulfill contracts on time. This timing and type of travel wasn't as conducive as I thought it would be. I struggled with motion sickness when tall trees flipped shadows over my screen or page while moving. So I moved to the back of the RV and dropped the curtains. But then I'd still get bounced all over the place. I often use a dish cupboard liner to keep my laptop stuck to the RV table so it won't go sliding off onto the floor. I use a wireless keyboard in my lap. My mouse is on a mousepad that just happens to stick to the table all on its own. But the mouse likes to fly around sometimes. I've gotten good at reacting and catching a flying mouse. The Columbia Gorge sternwheeler dinner cruise. Well worth the two-mile walk round trip to get there from the RV camp. What did we do? 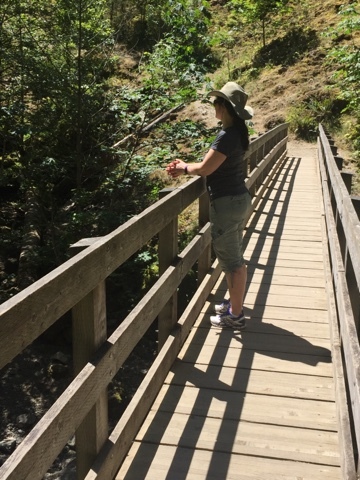 Hubby and I like to hike and try unusual restaurants and experiences. 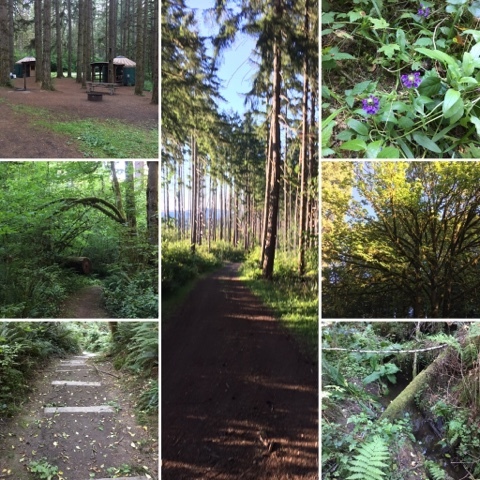 So we did hike a couple of times in state parks. We did take an antique train ride (impromptu when we heard the whistle near our campground). 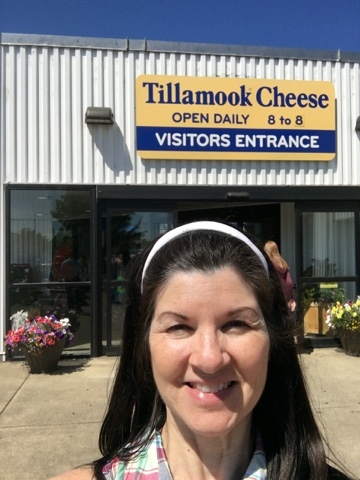 Visiting the Tillamook Cheese Factory was a definite tourist trap experience, but hey, it's cheesy and you have to have at least one of those on a vacation. 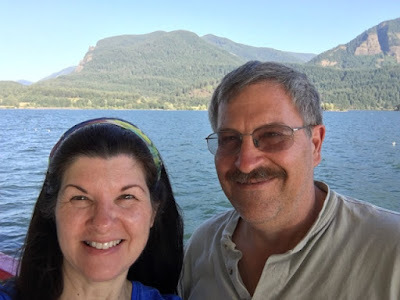 We did walk over two miles roundtrip to catch a sternwheeler on the Columbia Gorge. 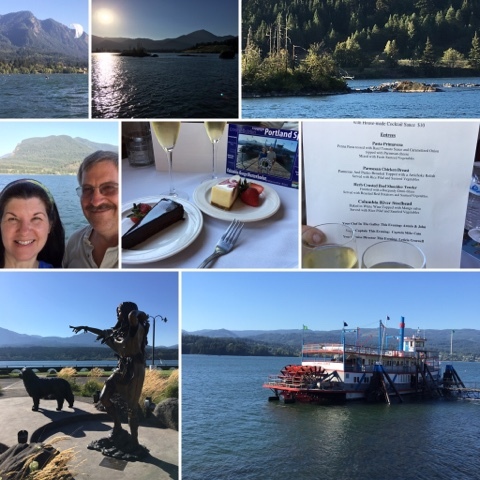 That sternwheeler had a lovely dinner cruise. 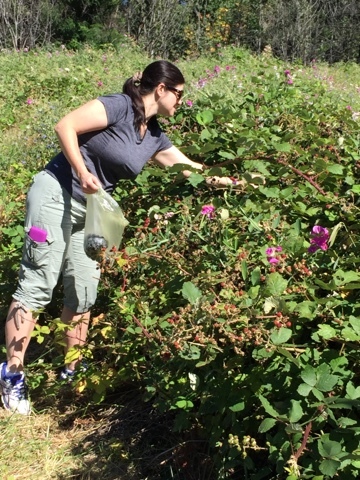 And we did pick blackberries that we made into chocolate blackberry ice cream for a spontaneous family dinner the night after we came home. Some very nice experiences. Visiting Kelsey, she camped with us one night and then we took an antique steam train ride just because we heard the whistle blow! 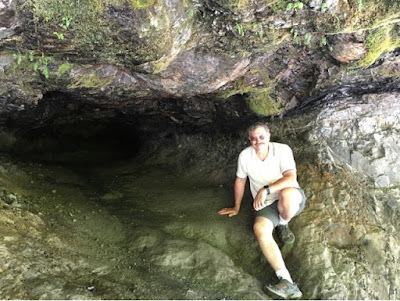 We found a fun cave while hiking. Overall. I still had some fun, though I had a really hard time letting the business side sit while doing an activity each day. I felt an intense stress knowing things were backing up. I knew what was going to happen and it did. I had to pull two all-nighters when we got home so I could finish contracted work. I also had over 1,000 emails to process due to intermittent internet while on the road and emails that didn't download from the server for some reason. I finished the last two units of my first college class and prepped for the final. 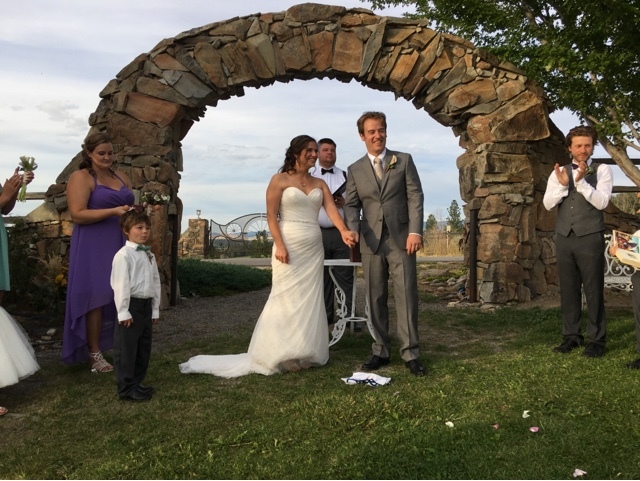 Then my daughter's wedding took first priority. And I had another 1,000 emails backed up due to wedding festivities... I created a new filtering system in my gmail account to help manage the volume of emails I get daily. All because these events this summer made it necessary. Mariah is now married! Beautiful bride and wedding. 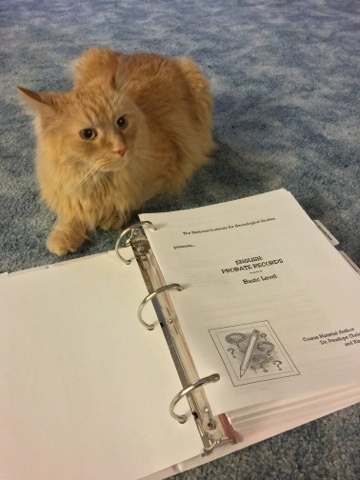 Muse: You try tutoring Writer on summer schedule! If a vacation isn't possible, realistically we can still take a couple of hours now and then to do something enjoyable. That something might give you new ideas, but it at least gets you out from behind your computer to refresh your mind in ways that work cannot do. (Remember, I'm a full-time writer and this is my day job. It might be different for a part-time writer who has a different day job.) It gets us time with our family or spouse to keep our relationships healthy. As writers, we still have to meet our commitments. I hope to take a real vacation in the near future, but I'll be honest and tell you I don't think it's happening any time soon. Although, I'm saving my frequent flier miles working toward a bucket list research trip to Scotland. Hubby's not really looking forward to that one. Just like moving camp spots every day isn't my cup of tea, researching Scottish history and ancestors isn't his. But we still will find fun things to do together to build relationship and memories. Final word. Boy, do I have more experiences I can draw on for books! I'm glad I've taken a day now and then or a few hours to keep putting life and experiences into my tool chest. Without them, I'd have little to draw on to build stories and characters.